Worried that some children may have drunk lead-tainted water at Boston schools, the city council called Friday for drinking fountains to be shut off at schools citywide. School officials rejected the idea, but said they would listen to councilors’ concerns. The officials reiterated that all fountains that were active as of Friday had been tested in recent weeks and that those results, which have been posted online, showed no lead levels above regulatory standards. School Superintendent Tommy Chang has invited councilors to meet with him on May 18 to discuss the issue further, officials said. Most Boston schools are already using bottled water because of lead concerns. Fountains remain in use at about three dozen schools. 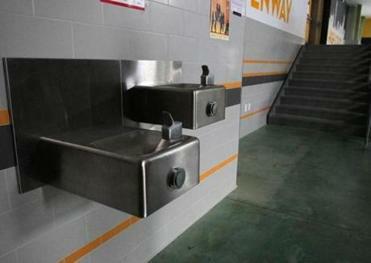 Officials are investigating why fountains in some schools were mistakenly turned on before water testing was complete. In a letter Thursday to Chang and School Committee Chairman Michael D. O’Neill, 12 of the city council’s 13 members called for a moratorium on fountain use at city schools. “We are outraged at the BPS announcement that some students may have consumed water that was contaminated with lead,” the letter said. The letter called for all fountains to be shut down immediately, and replaced with bottled water until further testing shows they are safe. In a series of announcements over the past few weeks, school officials have revealed they recently found lead-related problems in a total of eight schools. Those fountains have been shut off and replaced with bottled water, officials have said. Chang has said all the active fountains were tested in April and the results were “triple verified” by officials from the school department, city water commission, and a third-party contractor. But the councilors in their letter expressed uncertainty, saying the school district had told parents at some schools that the water there tested at acceptable levels, only to later reveal that high lead levels had actually been found. “Parents at several schools were wrongfully told that lead levels were not a cause for concern. However, findings show that these schools have lead contamination,” the letter said. Parents have said that they are worried for the health of their children — and frustrated with school officials. School officials disclosed this week that at four schools, students may have drunk water with high lead levels because newly-installed fountains were mistakenly turned on earlier than they should have been. School officials have blamed the mishap on a lack of communication between its facilities staff and a third-party contractor. Officials had previously said none of those fountains had been turned on after being installed. On Thursday, officials said that two facilities department employees had been placed on administrative leave as officials investigate the issue further. The fountains were being turned on as part of a plan launched last year to try to restore fountains for use at more schools in order to save the money the district spends to provide bottled water. School officials recently put the brakes on the plan. About 90 Boston schools already use bottled water — and have done so since the late 1980s — because of concerns about lead seeping into the water from aging plumbing. Bottled water is expected to cost the district $415,000 this school year. The district stepped up testing of fountain water in schools this spring, aiming to check each building where the fountains were running at least once annually — and to post the results online. Previously, it had only done enough testing to meet regulatory requirement, testing two schools per year, which left some schools untested for years. Children, as well as pregnant women and their fetuses, are particularly vulnerable when it comes to lead. Exposure has been linked to IQ deficits, shortened attention spans, behavioral problems, hearing damage, stunted growth, and lowered birth weight.